In response to the growing disparity in income and prosperity among Miami-Dade County residents, FIU’s Metropolitan Center and Citi Community Development launched a “Prosperity Agenda for Miami-Dade,” a groundbreaking research-based community action plan that identifies specific wealth-building strategies to improve economic opportunity and self-sufficiency. A two-year pilot program, the plan would directly impact as many as 2,300 low-income families, as well as the broader economy and residents across the income spectrum. The plan’s recommendations – to be implemented by a collaborative of private, public and non-profit partners – include the creation of three social enterprise incubators and accelerators, providing $20,000 in seed capital for 32 businesses per year over two years. The plan also calls for the use of community land trusts to develop 100 units of affordable workforce housing, the creation 2,000 children’s savings accounts, and funding to develop five employee-owned business cooperatives. Additionally, the plan recommends the establishment of a community benefits agreement policy to require developers and business owners to provide specific benefits as part of their expansion or relocation. During the event unveiling the report’s findings, community leaders from the public, private and government sectors stepped up to announce plans to implement the study’s recommendations. FIU is developing several business accelerators and incubators, including Startup FIU, which will launch three innovation hubs this year. Miami-based nonprofit Catalyst Miami and the Mourning Family Foundation are working to implement children’s savings accounts, and Health Foundation South Florida is supporting employee-owned business cooperatives. 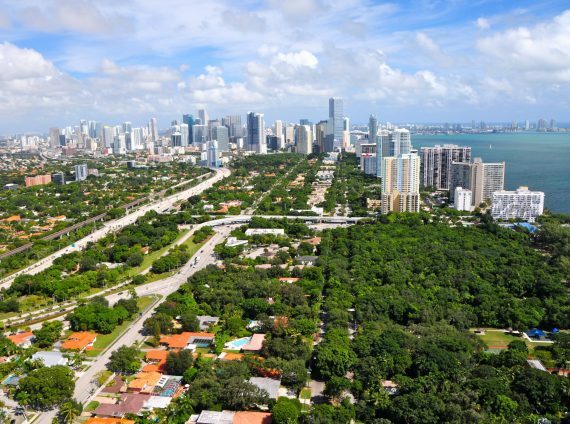 Miami-Dade County commissioners, including Commissioner Danielle Levine Cava, who commissioned the prosperity study, highlighted recently passed legislation to establish community land trusts, as well as efforts to increase affordable housing and implement community benefit agreements. The recommendations emanate from the Miami-Dade County Prosperity Initiatives Feasibility Study, a landmark report by FIU’s Metropolitan Center and Miami-Dade County with funding from Citi Community Development. The study, authored by senior research fellow Kevin T. Greiner and contributing author Edward Murray, identified for the first time a growing “prosperity gap” affecting not just the county’s lowest income earners but also workers, households and families across all income and occupational spectrums. According to the Center’s research, over 20 percent of the county’s population lives below the poverty line—a proportion that is 33 percent higher than the national poverty rate. This makes Miami-Dade County the 18th most income-unequal county in the U.S. Furthermore, median incomes in the county have dropped 13 percent since 2000, compared to a national drop of 7 percent during the same time. If fully implemented, the projected cost of the two-year pilot will be a combined investment of $9.6 to $10.3 million. To download the full report, please click here. For more information, email amy.ellis@fiu.edu. The research of the Metropolitan Center provided insight of the economy of South Florida.